We are asleep now. Please come back later! I’ve decided to start writing here, finally. I don’t particularly want to think of myself as a “blogger.” Mainly I want to work on my writing — or more truthfully, work on my thinking. And if someone reads these thoughts and wants to write to me or leave a comment,that’s o.k. My name is not Robert Angelo. My first name, though, is, in fact, Robert. I have a tattoo on my left shoulder of an angel flying, carrying a man in his arms. The image has great meaning for me, but I’m not going to write about that tonight. I am a middle-aged gay white man. My home is near Houston, Texas, where I live with my partner, who I shall call F., our cat, two dogs, and three fish. 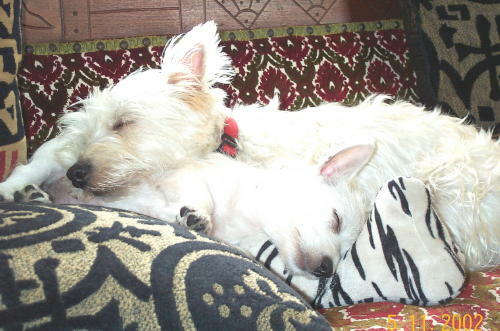 The dogs are West Highland White Terriers, and they and their photos will appear here frequently. The cat will lurk here, too, and from time to time she might pop in and say something. She is around ten years old, and knows many things. The fish don’t have much to say. Both my parents passed away last year. I was close to my mother, more so than I realized until she was gone. My father had had dementia, and he had lived in a care facility for several years before he died. In many ways, I had let him go long ago. But every day I find new ways to miss my mother. I’ll write more about this later. Thanks! I used to drive by that place almost every day when I lived in Encinitas a few years back. Great to see it again!